We had a great Thanksgiving with the Cain’s and Nana. Charlie was good and let us almost finish eating our turkey and dressing before demanding his Thanksgiving lunch. He is growing so fast and changing so much every day. 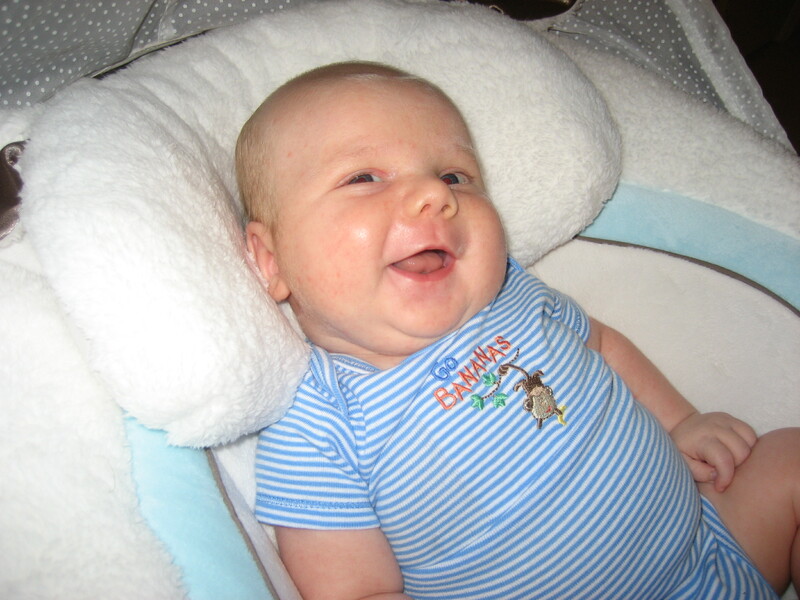 He’s cooing, smiling, and laughing all the time. 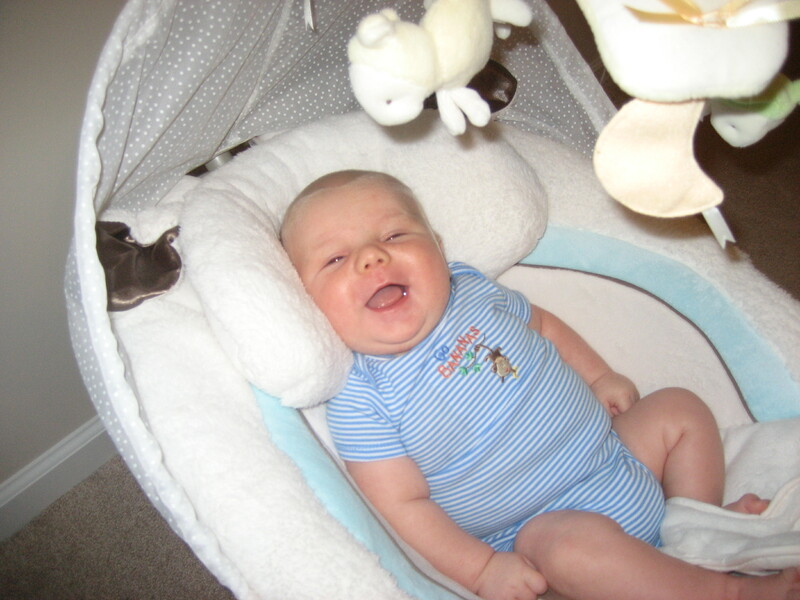 I thought I loved it when he was a tiny newborn, but this new stage is so much fun to interact with him. I’ve put a video and a picture below. The video is from a couple days ago when he was flirting with me from his lamb swing. 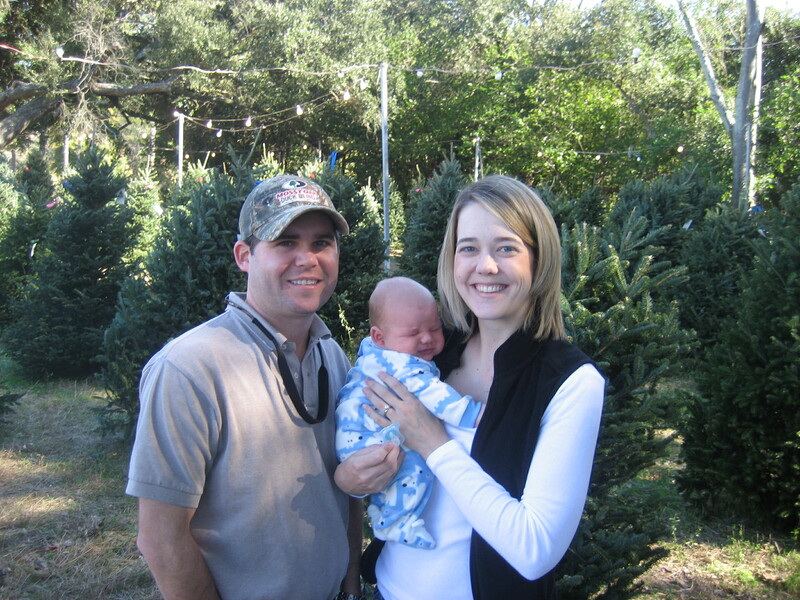 The picture is from this morning and makes me look like a liar above because my normally happy baby is crying and red in the face during our family portrait at the Christmas tree lot. It’s a shame, too, because it’s hard to get Travis and I both smiling at the same time with our eyes open in a picture. We’re looking forward to enjoying the holidays and my last month off before work. We started decorating the house and shopping for Christmas presents last week because it is taking me much longer this year to find the time. Hopefully we’ll have everything wrapped up by next weekend and we’ll get to really enjoy three weeks before Christmas in a festive home. We hope to get to see lots of you over the next month. Can you say Fat and Happy?? These were hilarious to me – taken this afternoon after tummytime. Charlie had a rough morning – he got ousted from all of his usual lounging around the house because the cleaning ladies arrived at 9:00 am. It has kept him awake for much of the morning, including trips with Mom and Dad to Kinkos, Target, and his grandparents’ house (this was a pit stop for feeding since we didn’t want to go home and interrupt the cleaning). (Side note – if anything is out of place there, Travis did it, not me or Charlie). Anyways, we’re back home, freshly bathed and dressed (Charlie that is, not his mama), and now crashed out on the boppy while I check my email. We’re also busy packing for our big trip to Atlanta. I’m not sure there will be anything left in Charlie’s room and closet once I’m done because as I go item by item I am convinced I need it all (or I might). What if he all of a sudden decides he hates the bouncy seat and only wants to be placed on the Baby Einstein mat. I need them both!!! I’m going to be prepared. Dad, don’t worry when you see us tomorrow – we aren’t really moving in – it will just look like it. We’re looking forward to going to Atlanta and seeing so many of our favorite people – Charlie is going to remind me to take lots of pictures with everyone and post them on the website (particularly his Aunt Erin who has now seen him twice but I’ve neglected to take a photo yet because I get so busy talking to her). In other news, Charlie has had his first babysitters in the past week. Nana kept him this past weekend for Travis and I to go to dinner at PF Changs and to see Couples Retreat at the movie theatre. We had fun, but we did spend the entire time before the movie started scrolling through the pictures we have on our phones of Charlie. Then, last night, our friends Jason & Kristen were lifesavers and came to stay with Charlie for an hour at the last minute when we found out mine and Travis’s schedules were going to overlap. What schedules you ask?? Well, I’ve officially gone back to Bikini Boot Camp for the past two days and it is wonderful. I feel good getting out in the fresh air (or rain in the case of last night) and getting some exercise. Okay, I’ve rambled enough. I’ve put more pictures from the past couple weeks on facebook if ya’ll are interested. Better post to come after our trip to Atlanta.